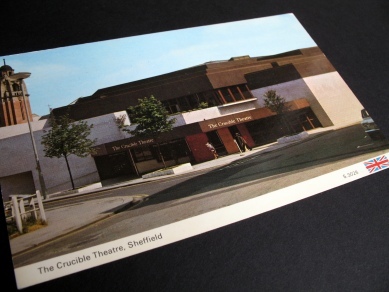 The Crucible Theatre in Sheffield opened its doors on 9 November 1971. Exactly 40 years later, I sat in the main auditorium and listened to six of its past artistic directors reminisce about productions and funding battles gone by. I also wrote this 40th anniversary tribute to my favourite building in my home city – a theatre once condemned as a folly but now in the prime of its life. If there was a curtain, now would be a good time to raise it. If there was a dress circle, now would be a good time to take your seat and adjust your bow tie. And if you never imagined the Crucible would live to see its 40th birthday, now might be a good time to sneak out and close the auditorium door behind you. Quietly! Because that uncompromising young upstart of Sheffield theatre – the unapologetically thrusting Crucible, with its fierce breezeblock face and its spreadeagled arena (and no curtain, and no dress circle) – is dangerously close to becoming a grande dame of the British stage: at 40, it is respected, even revered, by actors and audiences alike. 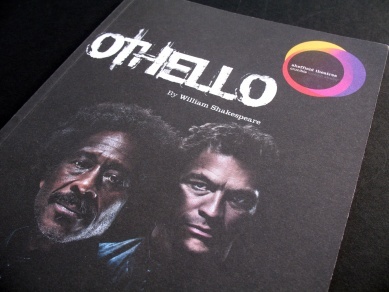 You only have to look as far as its 40th anniversary production of Othello, with world renowned performers like Clarke Peters and Dominic West in its cast, to know that these days, the Crucible has serious pulling power. But on its opening in November 1971, this outcome seemed unlikely to many. Critics were quick to condemn the building as a folly, a step too far into Sheffield’s brave new civic world. And at the heart of the matter was that extraordinary thrust stage – a platform for presentation so wholly at odds with what Sheffield theatre had become by the tail end of the 1960s that it’s hardly surprising the city’s citizens weren’t quite sure how to take it. By the middle of that decade, theatre in Britain was changing. The grand Victorian and Edwardian venues were facing difficult times, with some becoming victims of the wrecking ball, and others – like the Lyceum – suffering a combination of bingo, dry rot and neglect. But in spite of this bleak new reality, repertory theatre – with its resident companies and weekly cycles of old standards – was undergoing something of a revolution. The Sheffield Repertory Company, along with others nationwide, was bursting with ambition. Housed in the cosy Sheffield Playhouse on Townhead Street, it had once subsisted entirely on box office income, relying on a loyal audience to keep it afloat, but it was now in receipt of an Arts Council subsidy that enabled it to raise its horizons. Under the artistic direction of Colin George, there were exciting new plans for theatre in education, for community work, and for productions that wrestled with the changing times. And to George, one thing was clear: if the company was to achieve its potential, a brand new building was required. In 1967, Colin George met that great man of the theatre, Sir Tyrone Guthrie, and though he was already thinking adventurous thoughts before the encounter, it was this meeting of minds that made something like the Crucible seem suddenly possible. Guthrie had pioneered the use of the ‘thrust’ stage – three sided, with the audience in a steep sweep surrounding the performers – in Ontario and Minneapolis, although his inspiration came from ancient Greece. He believed the thrust stage offered startling new possibilities, and he encouraged Colin George to pursue this vision for Sheffield. It was an age of rebuilding and of chest-swelling civic pride, and presented with a plan that seemed bolder and more innovative than the new theatres springing up elsewhere, Sheffield’s powers-that-be gave George the backing he needed. It seems extraordinary now that such a far-sighted plan could suffer so little compromise, but the Crucible auditorium is the legacy of these people’s belief in the city’s theatrical future. Inspired by Sir Tyrone Guthrie, designed by his associate Tanya Moiseiwitsch, and driven to completion by Colin George, that famous star-spangled arena owes them much. Sir Tyrone was to have directed the first production on the Crucible stage – The House of Atreus by Aeschylus – but sadly, he died in July 1971, just four months before the new theatre was set to open. 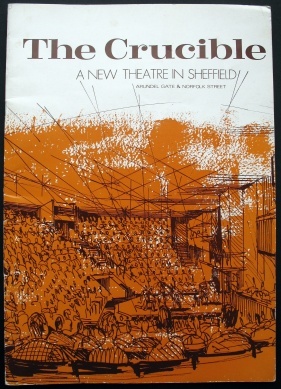 Changes were made to the planned programme, and following a first night gala performance called Fanfare, the first full Crucible show was Colin George’s production of Ibsen’s Peer Gynt. Sheffield journalist Stephen McClarence, theatre critic with the Yorkshire Post through much of the 1980s, saw the show as a young student. But while responses to the theatrical side of things may have been mixed, the Crucible’s financial performance was a problem from the start. With Peer Gynt playing to just 47% capacity and with a chorus of nay-sayers waiting with their told-you-so laments in the wings, Colin George’s Crucible reign seemed to be a case of constantly trying to find the drama hidden deep within the crisis. However, he delighted Sheffield by introducing spectacular musicals like the European premiere of Chicago, and it was on his watch that snooker was first introduced – a decision that not only undermined the ever-present charge of elitism, but that also delivered a sensational PR coup. And to the surprise of many, the Crucible survived; and really, we just got used to it. Since then, a succession of artistic directors has wrestled with that vast and uncompromising space, combining its undoubted challenges with their own visions to create distinctive theatre for the people of the city. And ‘distinctive’ is what the best Crucible productions usually are. Shaped by a building that was the product of its time, a good Crucible show has an inclusive, three dimensional quality that cannot be reproduced in the ‘traditional’ proscenium arch theatre. 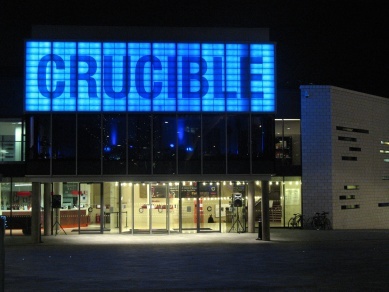 And in any case, Sheffield now has the best of both worlds, as the Crucible works in tandem with the Lyceum to present some of the finest work on the British stage today. So… a moment then to remember some of my favourite Crucible moments from the past 40 years. I grew up with the place – my first show was the 1972 Christmas production of Pinocchio – and because it was the only professional theatre I knew, I saw nothing controversial in what it did. I suspect this is the case for many of my generation and younger, who simply cannot remember what went before. Really, I could go on. And thankfully, distinctively, amazingly, so will the Crucible. This article was originally published in ‘My Kind of Town’ magazine in December 2011. Grateful thanks are due to the legendary Sheffield journalist Stephen McClarence for his help with this piece.